According to Tom Wright, Director of Sales and Marketing, when used properly, a Personal Air Breathing Unit will work with the existing filtered compressed air supply. The Personal Air Breathing Unit, will provide Grade "D" Breathable Air for a proper NIOSH approved respirator, and with the provided 54" tool air hose assembly, it will allow for a by pass of air for a paint spray gun. The Personal Air Breathing Unit is a 20 SCFM system. This will allow for use with full hoods, equipped with vortex cooling tubes, if so desired. 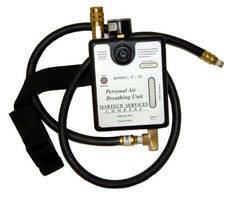 The Personal Air Breathing Unit works with the existing filter compressed air supply. The existing filter must provide air quality equal to that required for a flawless paint finish. The Personal Air Breathing Unit is complete, belt mounted system, with a built in filter with filter monitor, and a carbon monoxide monitor with both audible and visual alarms. The monitor runs on a single battery, and continuously monitors the air for compliance with current OSHA standards. With the ever increasing awareness and need to properly protect workers while working in contaminated air spaces, systems are available that are designed for multiple users at the same time. Accessories can even increase or decrease the temperature of the air supply for improved user comfort. Major corporations look to Martech Services Company for their air supplied system needs. National dealer equipment programs and major paint manufacturers, alike, have chosen Martech as their preferred source. Additionally, each system is back by a one year warranty and supported by a toll free sales and service, telephone support staff, around the clock, 7 days a week. More information on the Personal Air Breathing Unit, Model P-20 can be obtained by calling Martech Services Company at 1-800-831-1525, or by visiting their Website at: www.breathingsystems.com.